Second, also like Seinfeld, Everybody Loves Raymond scrutinizes the insignificant details of daily life and reveals how such analyses directly and humorously affect its characters. It is now common knowledge that Seinfeld procured the title “a show about nothing” because it created segments and sometimes entire episodes around such typically mundane topics as waiting in line at a restaurant, re-gifting a present, finding a hair on one’s food, and double-dipping a potato chip. In the same way, Raymond regularly makes something out of nothing. 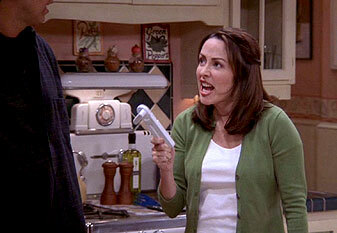 For example, episodes unfold around a fruit-of-the-month club (1.1), an engraved toaster (3.59), a can opener (4.76), P.M.S. (4.95), sneezing (5.107), choking (5.109), a vacuum cleaner (5.115), the wrong brand of Kleenex (6.135), sighing (7.154), the placement of a suitcase (7.196), tardiness (8.185), eating habits (8.189), and smoking (9.209). Raymond: Wow, dad, I never thought there was a story like that behind you and mom. It’s almost romantic. Frank Barone: Yeah, I know. I don’t tell that story a lot. Similarly, in “The Plan” (7.165), Robert and his fiancée, Amy (Monica Horan), reconcile after fighting over misspelled wedding invitations. Before the entire Barone clan, Amy confides, “Robert and I are getting married, and I want us to be honest and trusting. […] I want to get married because I know how great it can be. Maybe it isn’t easy, but I think it’s worth going for.” Robert lovingly concurs, and then the couple exits, leaving the viewer with a potential lesson about love, marriage, and forgiveness. Yet within seconds, that message is cut down with Debra’s dialogue, “Wow. Remember when we were that stupid?” The frame fades to black. The resemblances here are uncanny. Not only does some of the language match word for word, but also the (long-standing) philosophy that marriage is a prison and that once a man enters it, he is never alone or allowed to do what he wants to do. Indeed, married life can be, both shows argue, “a sad state of affairs.” No hugging, no learning. One reason that this family sitcom gets away with such traditionally non-familyish qualities is that the Barone children (played by real-life siblings Madylin, Sullivan, and Sawyer Sweeten) rarely appear; they are usually, one critic notes, “tucked out of sight, leaving the adults to have at each other.”13 This setup differs dramatically from similarly constructed family sitcoms of the last couple of decades like Family Ties, Growing Pains, Full House, The Cosby Show, and Home Improvement — series in which “the situation was typically a problem involving one of the children” and the parents would “guide the child through a solution, providing a moral lesson along the way.”14 But again, this break from the norm is probably something viewers of Raymond should expect. After all, despite its surface appearances and traditional three-act structure, Everybody Loves Raymond is not like other family sitcoms. Rather, its juvenile characters with virtually no redeeming qualities and its almost complete rejection of moral lessons place it closer to its predecessor and short-lived contemporary Seinfeld than those which featured the always loveable Bill Cosby or Tim Allen. Kelli, I think you make some interesting and purposeful links between the two series, but I tend to resist the notion that these connections would result in a logical audience shift from one to the other; on the contrary, I think that the context of each series’ characters and actions are diametrically opposed. The same people who enjoy single people being horrible to one another may find it garish for a family to do the same, and those who are able to enjoy Seinfeld irreverence may balk at the same sorts of traits being mashed together (to my mind, as we’ve discussed in the past, unsuccessfully) with the family sitcom mold. The two series may engage with similar ideas, and those ideas may occasionally appear similar on the surface, but the reasons they are being deployed seem very different for me. If you were to show someone who had no knowledge of either show a scene from each, I do think that they could engage with similar issues within both (the marriage scene is a fine example of that), and there’s certainly value to isolating them in order to discover how two very different shows are playing with similar ideas. However, I don’t think that regular viewers can so disassociate Raymond from its fairly traditional sitcom feel that it becomes synonymous with the far more subversive structure of Seinfeld, nor can they ignore how Seinfeld became the center of a cultural zeitgeist and Raymond became a show which skewed old and was the antithesis of hip. I have no doubts, just so we’re clear, that Raymond has its fans and its place: I just think that the Seinfeld comparison reduces the series to basic qualities which were at times unseen amidst the context of the series’ broadcast, and I don’t think that we can minimize that reception within the discussion when viewer opinion is involved. You write that a comparison of Raymond to Seinfeld “reduces the series to basic qualities which were at times unseen amidst the context of the series’ broadcast.” I’m not sure why you would conclude that Raymond‘s qualities — I’m assuming you mean juvenile, narcissistic characters, no hugging no learning, etc. — were “unseen” during the show’s original broadcast. Several critics, fans, message boards, etc. pointed to these traits while the show was on the air — just as they pointed out the similarities between it and Seinfeld. I’m also a bit confused by your claim that Raymond “skewed old and was the antithesis of hip.” Re: hip, maybe; but skewing old isn’t correct. In fact, Raymond was ranked highly among the networks’ target audience, 18-49 year olds (I had several links here, but Flow said I was spamming). Moreover, the series currently attracts the same age group in syndication on TBS. I think something else we might ought to consider re: Raymond and Seinfeld is that many who watched Seinfeld during its heydey were single, youngish Gen-Xers (like myself and my friends who still quote the show to this day). But when it went away (and Raymond hit its prime), many of these audience members (like me) had grown up, become professionals, married, moved to the suburbs, etc. 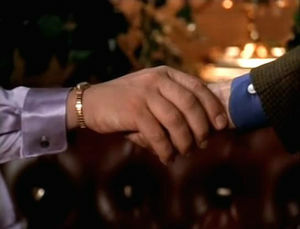 As a result, in Raymond we found many of the same qualities that we appreciated (for good or bad) in Seinfeld. Before reading this article whenever I watched Everybody Loves Raymond I would never think that it was a similar show to Seinfeld. Everybody Loves Raymond is a suburban family sitcom while Seinfeld focuses on the lives of friends living in the city of Manhattan. One major statement that I read in the article that made the shows a lot more similar is when Marshall says “One reason that this family sitcom gets away with such traditionally non-familyish qualities is that the Barone children rarely appear; they are usually, one critic notes, “tucked out of sight, leaving the adults to have at each other.” After I read this I thought back at all the episodes and realized that probably only one or two of them focus on the kids problems. The only time you see the kids in many of the episodes is when they are playing in the back ground or used for the adult characters to do something funny with them. I feel that this totally takes Everybody Loves Raymond out of the classic family sitcom genre. Unlike shows such as Home Improvement or The Cosby Show that usually had plots evolved around the children having problems and the adults helping them overcome them, Everybody Loves Raymond had similar plots to shows like Seinfeld. I feel that is why Everybody Loves Raymond became as successful as Seinfeld because it was sort of a family sitcom, but mostly focused on adult issues in a funny way. The shows would poke fun at the small things in life, such as opening a can opener or fighting over a parking space, and then evolve the rest of the show around that. That is why these two shows became so popular because they took something so simple that the audience could relate to and made it funny. I’m a bit late, but this is a nice comparison. 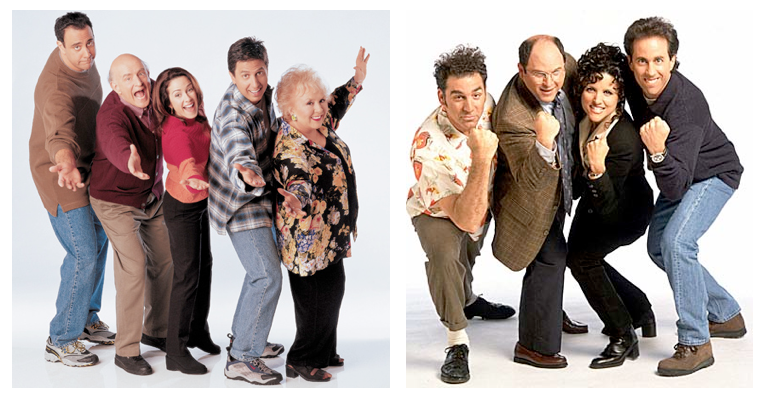 I was a fan of Everybody Loves Raymond, and found later that I enjoyed Seinfeld as well. I agree with Kevin that what makes the shows fun and entertaining is that we can relate to them. btw, as for the critic who made tho comment about the kids being tucked away. This is not news. this is a premise of the show. in the opening credits for the first season, Ray introduces his kids and says, “it’s not really about the kids.” lol. absolutely right! the kids make very little appearance. only appearing when it gives the adults a problem. and can I say the only episodes that really focused on the kids are the ones I don’t really care for (it’s supposed to be fun, party dress, etc.) those episodes have redeeming qualities, but they break from the usual pattern of the show. even in the hug and learn rule. raymond – is an utterly sincere – and suitably tortured – investigation of the question of whether our basic values can survive the ordinary ethical challenges of everyday family life. with a common-sensical world view (the one that’s implicit particularly in our family lives – in which kindness is better than cruelty and we should all try to be straight with each other at least most of the time) – a common sense world view beset by the profoundly genuine worry that our commitment to the common sense values that are the conceptual foundation of family life (love don’t hate; protect and support don’t threaten and attack) – is a commitment based on illusions, something that cannot survive honest confrontation with the detail of everyday family life. so on one picture (seinfeld) we’re shown that what people think matters doesn’t (and maybe what they think doesn’t does – but only because its so silly); on the other we’re shown that maybe we’ll be able to be decent in and through our families, and maybe we won’t; we’re reminded both of how deeply we are committed to a set of basic moral values (in virtue of being children, brothers, fathers, husbands, mothers-in-law etc.) and how uncertain we must be about whether that commitment makes sense. on one picture we know that life is ultimately senseless; on the other we assume that it makes sense but worry endlessly that we are wrong to do so. 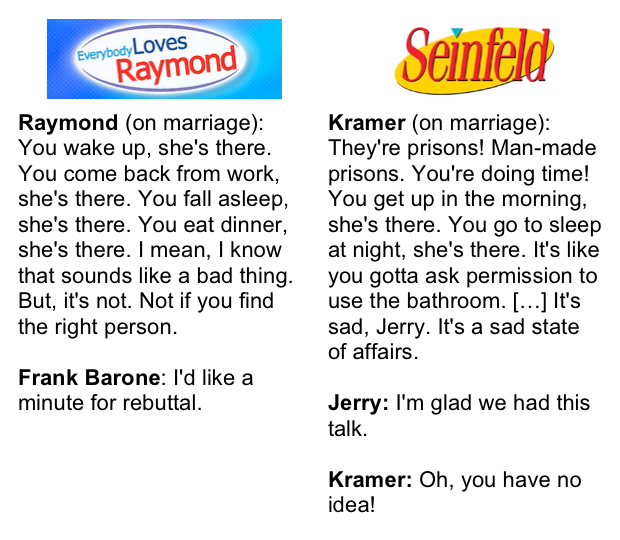 i adore seinfeld – but raymond is massively better – more significant, more honest, more challenging to watch. for raymond and debrah pain and protracted distress are still real possibilities – for kramer and george they were never on the cards (‘Great! i always wanted to pretend to be an architect!’ – that person can have no fear that the traditional values will devalue themselves. for seinfeldians that has already happened – its old news. Everybody Loves Raymond is a boring, plodding and completely predictable sitcom that is no different to what came before (or after) it. It has dated badly. Seinfeld was cutting edge for its time (and still remains fresh to this day), and remains very watchable. Comparing the two is ridiculous, its like comparing dog food and filet steak!